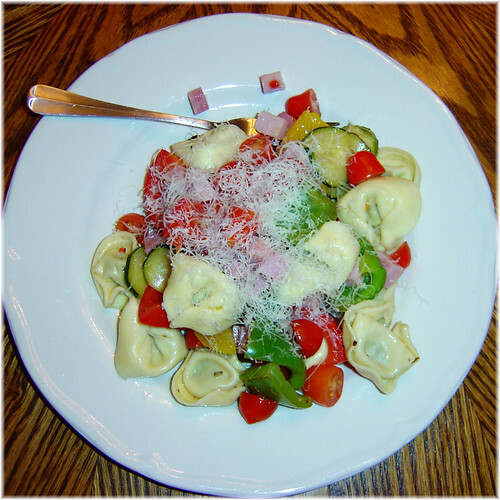 Summer Tortellini Recipe up at Kitchen Comforts. This makes me so hungry - looks super yummy! This looks perfect for a hot Summer day, light and fresh. Speaking of kebobs ((you say kebabs, I say kabobs, let's call the whole thing off... sorry)).... I have our left-overs frozen, when thawed I thought of trying to create a stir-fry. Think it'll work? I will, when I'm brave enough to attempt it. I didn't use a glaze, marinated the chicken in a light italian dressing. The boys don't care for really strong flavors when trying something new. I start out kinda bland and ease them into it. They enjoyed these. Bay even ate the onions after coaxing and loved them. Oh, that looks really, really yummy! Monique: Italian Dressing tends to be a standby here when I don't feel like mixing up a glaze. That or the Lawry's marinades. They have a Pineapple Terriyaki one, which was the inspiration for mine. Thanks Scary Mommy! The leftovers were great cold too.